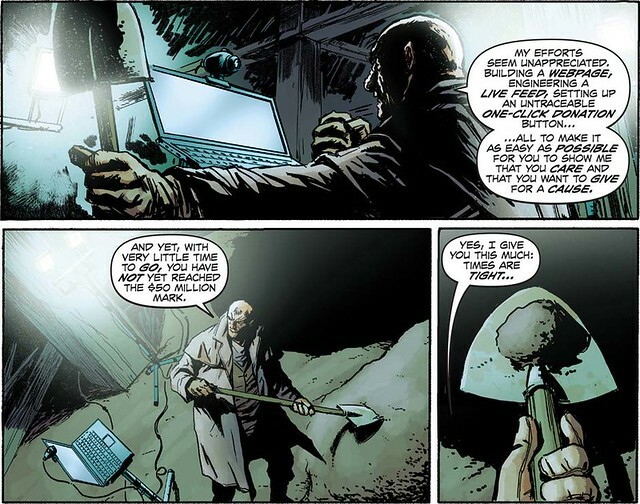 Both Mark Waid and John Rogers have commented that the thing that bugged them most about FREAKANGELS was that you had to scroll the pages, on most screens. Also, that we just posted print-ready pages. That’s why I developed the two-tier structure of FREAKANGELS pages. You go left to right, then down and left to right again. The two-tier structure makes it easy to scroll down to and easy to figure out, without elaborate coding. On my iPhone, I found that one regular-sized panel (the page was usually quartered) filled a screen nicely. But, anyway: easy. FREAKANGELS was an experiment, but I was mindful that Avatar were gambling money, so I usually erred on the side of frictionlessness. The full page bugged some people, is what I’m saying. As did scrolling. So the new crop of high-profile webcomics projects are all about eliminating the scroll. Let me preface this by saying that I’m acquainted with, like and respect all the writers here, am impressed by all the artists, and think that all three projects are fun and worthy works. Indulge me as I take a look at something about them that struck me earlier this week. Here’s a “page” from Rucka & Burchett’s LADY SABRE AND THE PIRATE OF THE INEFFABLE ETHER. And one from Waid & Krause’s INSUFFERABLE. This comic is quite ingeniously coded. 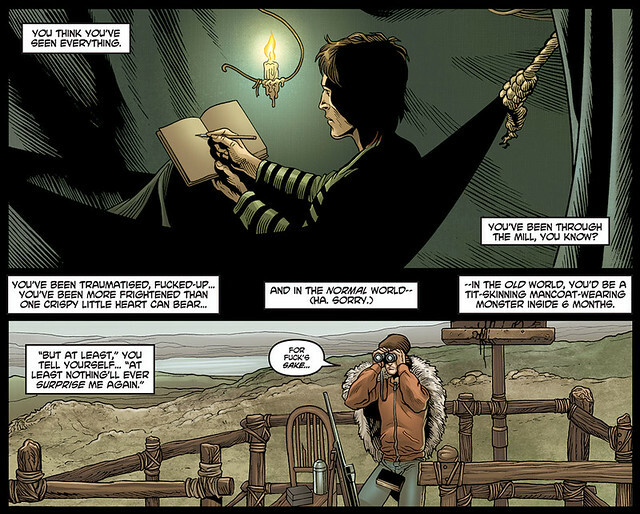 And from Spurrier & Barreno’s CROSSED: WISH YOU WERE HERE. Each “page,” each screen as Waid thinks of them, is roughly half the size of a regular comics page. Creating a future print object, then, involves assembling two screens into one page. Fitting them together, basically. Which is not as easy as what I did, but pretty easy, and there are any number of ways to skin a pixellated cat. What else do we notice about these three screens? Two-tier storytelling. Isn’t it strange how all three teams have gone to two-tier, independent of each other? Maybe not. You’ve cut the print page in half. If you want each screen to make sense as a discrete entity, you have to respect the cut. If you want each screen to contain enough information to make it worth reading, you need a strategy to maximise your panelling. And if you want to be able to stretch out and get a big picture in there while still maintaining storytelling coherency, you’ve kind of got to go wide on the page. I’m not saying OMG NO-ONE HAS EVER USED THIS FORMAT IN TEH WEBCOMICS BEFORE. I’m saying it’s interesting how all three went to it. They all break two-tier occasionally (just as I occasionally, for strong effect, broke the FREAKANGELS method). INSUFFERABLE more than the others. I don’t want to be accused of cheating – the most notable breaks in INSUFFERABLE, for instance, tend to constitute a spoiler to my mind, so I didn’t use them. But I don’t think it’s unfair to say they all default to two-tier. And it would seem to be an inevitable consequence of the comics “screen”. You can see how that would work as two screens. But the lower half becomes serious use of real estate, an entire screen in an episode that’s only ten or twelve screens long. The other argument that I made with FREAKANGELS was, basically, if you don’t like it, then I refer you to the fact that I’m not charging you money for it. That was my license to do what I liked with the storytelling. Which, for me, meant that I could take the story at whatever pace and in whatever tangents I desired. That obviously also holds for the three webcomics I’m talking about, too. Going forward, I like to think that that is what will eventually differentiate webcomics from paid digital comics, which will have to be structured to deliver instant and weighty bang for their iTunes buck. So, losing an entire screen to a single shot probably isn’t so bad. It may, however, reinforce the imposed limitations of the format. Last year, I had the interesting experience of an artist attempting to re-panel an entire comic to get rid of the double-page-spread I’d written. When I asked him what he was doing, he told me that he’d heard from a friend with an iPad that it was hard to view a DPS on them, and that since that was Teh Future, we should get rid of the DPS. I explained that the book was written for print-first, and that in this instance digital readers would just have to cope with going to landscape and zooming. If I’d been writing the book for digital, I very probably would have agreed with him, and found a way to do the image as a single full page image, or even enquired about coding the digital object to give me a swiping/tapping slippy screen in landscape, not unlike the recent “Marvel Infinite” object. Looking at these three comics this week, I’m wondering this: will we be able to tell the popular mainstream narrative comics of 2011-2012 by their slightly homogenous look? Is this the aesthetic that will stick enough that we’ll be able to point at a page and say, “four-tier – must’ve been a webcomic first”? I look forward to seeing how all this works out.